Royal HaskoningDHV has been connecting people for 135 years. Together, through our expertise and passion, we have helped contribute to a better society and improved people's lives with work underpinned by our sustainable values and goals. We are an independent international engineering and project management consultancy leading the way in sustainable development and innovation. Our 6 000 colleagues, working from permanent offices in more than 30 countries on projects in some 150 countries, are committed to our promise to enhance society together. We are driving positive change through innovation and technology, helping clients use resources more efficiently and creating solutions which connect with people to make their lives easier, happier and safer. Connecting lives is our history and our future. We are connected through a passion to work on projects that matter and to engineer solutions for our clients that go beyond the original brief. We are connected through work that is enhancing society, contributing to a more sustainable future for our children and our children's children. Water - The Life Giving Source. 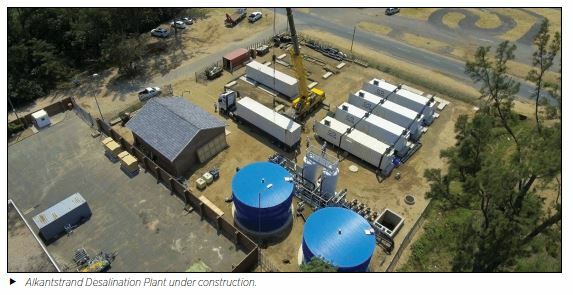 In response to a crippling drought crisis in Richards Bay, Royal HaskoningDHV designed and commissioned a 10Ml/d desalination plant to assist the region in overcoming the most severe drought in over a century. The whole project was completed in only seven months from appointment to water supply because of the state of the art plant and the use of existing civil infrastructure available for abstraction and brine discharge. The plant has a minor carbon footprint and allows for real time monitoring and control offsite. The unique system of 10 transportable units now generates 10 000kl/day bringing considerable relief to the community. New pumps draw sea water from Richards Bay harbour via an existing seawater abstraction structure that is part of the marine outfall pump station. Brine and backwash water from the plant is co-disposed with dense effluent to the Indian Ocean. Post-treatment in the form of remineralisation, stabilisation and disinfection. Buffer tanks ahead of post-treatment and for the final product water. Royal HaskoningDHV was appointed by North Coast Water Utility to carry out the design for the sea water intake pumps and pipework, the conveyance of brine and backwash water, the product delivery system, the administration building, the electrical system and the civil engineering design for the remaining plant. 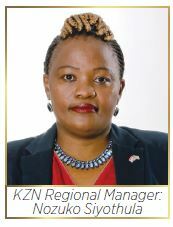 The Department of Water and Sanitation (DWS) launched the critical Richards Bay Desalination Plant in KwaZulu-Natal (KZN) in May 2017. The launch of the plant will assist in enhancing security of supply within the King Cetshwayo District Municipality. The Richards Bay 10Ml/d desalination plant is an excellent example of the art and science of the Civil Engineer being brought together to provide an emergency and ongoing guaranteed water supply. It is a technical showcase of civil engineering, requiring unique and innovative solutions to utilise existing infrastructure in providing a new source of water. Department of Transport and the BRT Lanes: Corridor C3 for eThekwini Transport Authority. that the KwaZulu-Natal Department of Transport and the eThekwini Transport Authority as well as the designers and contractors not only met the challenge head on, but came through the experience proud of their achievement. The design incorporated road safety considerations and mitigating measures, such as overhead pedestrian bridges, central barrier walls, pedestrian walkways, relocation of some houses falling within the road reserve, to mitigate conflict in movement between pedestrian and vehicle traffic volumes that might result in possible fatalities. The SAICE Awards, for the most outstanding civil engineering achievements of the year, honour individuals, project excellence and communityorientated initiatives. that we can be proud of and that others want to join. Our mission outlines what in essence we do and who we are. We are a people to people company. In partnership with our clients, we create solutions for the sustainable interaction between people and their environment: Enhancing Society Together.